How much was he on? 1 or 2 mill? Whatever they were paying him was a total rip off. Apart from his unbeleivable season in 2013 under Robbie Deans on the wing he has basically been a flop. Third on the list of all time try scorers for the Wallabies and likely to have become No.1 and currently the No.1 all time try scorer for the Tahs and SR in general. Not really a flop. It's a shame that he's gone full loon with his religious BS. So the NRL dont want him. I wonder where that leaves him now, where will he go? I have a feeling Raelene will pathetically backtrack and announce he is staying in the sport..
ARL Commission chair Peter Beattie has effectively slammed the door on any hope Israel Folau had of returning to rugby league by declaring the dual international fails the code’s inclusiveness test. Beattie, wary of further damage to a code that has spent the opening months of the season rebuilding its reputation in the eyes of sponsors and supporters, went on the front foot following revelations Rugby Australia was ready to sack Folau over his latest comments on social media. “He fails rugby league’s inclusiveness test,” Beattie said. “We’re about being inclusive. From our point of view rugby union has made a decision that clearly rugby league would support. The ARL Commission and NRL have spent recent months talking up the need to protect the game’s image. Hence the introduction of the no-fault stand-down policy, designed to take players facing serious criminal charges out of the spotlight. The rule was brought in to ensure sponsors and supporters didn’t depart en masse. Folau hasn’t been charged with a criminal offence, but he has been found guilty in the court of public opinion following his latest utterances on social media in which he suggested homosexuals and “other sinners” would go to hell. In the current climate, the commission has no desire to see Folau back in the code. Clubs are often more forgiving and some would no doubt relish the chance to sign Folau, given he remains a top-shelf athlete, capable of having a transformative effect on any rugby league side. North Queensland need a fullback after missing out on Valentine Holmes and were quickly linked with the former Brisbane and Melbourne star. However, it is understood they do not see Folau as a No 1 in rugby league and have no interest in signing him regardless. They would prefer to hold their nerve and wait to see how Holmes pans out in America. The New Zealand Warriors have money burning a hole in their pocket. The Warriors recruitment manager Peter O’Sullivan was the man who discovered Folau as a teenager, taking him to the Storm where he took the first steps on a career that has bridged codes and made him a household name. They could explore the possibility, although again they would need to convince their supporters, sponsors and the NRL that he is worth the risk. The same applies to numerous other clubs who have space or could make it to sign Folau, among them Newcastle and Wests Tigers. Parramatta also have history with Folau, having tried to sign him when he first returned from the AFL, only to lose out to rugby. They have loads of money but have other priorities, most notably captain Clint Gutherson and halfback Mitchell Moses — the club held a recruitment and retention meeting yesterday as news was breaking of Folau’s likely termination by Rugby Australia. It is understood they could table a new deal to Gutherson as early as today as they look to put their supporters’ minds at peace before they begin life at their new stadium — they play their first game there in just over a week. Regardless, the Eels were inadvertently dragged into the saga when two of their players — Tim Mannah and Michael Jennings — liked Folau’s Instagram post. Mannah later unliked the post after being contacted by club officials. There was a time when clubs would move heaven and earth to sign Folau. So too would the NRL. Chief executive Todd Greenberg has a strong relationship with the dual international and spoke to him the last time he came off contract to gauge whether he would be interested in switching back to rugby league. It is hard to envisage him doing the same again. Folau will no doubt land on his feet. He is only 30 and remains an outstanding athlete. Someone, somewhere will take a chance on him. It seems unlikely it will be in rugby league. It's also a commercial decision for Qantas to be in commercial agreements with Qatar Airways and Emirates (both airlines being state owned) where being LGBT is a crime. It would be a tad hypocritical of Qantas to withdraw their sponsorship over this when they are happy to make money off those countries. I guarantee any outrage over Qantas continuing to sponsor Rugby Australia would not impact the Qantas bottom line in any way. We have an airline Duopoly in Australia and people won't change travel plans to head overseas. I think Folau is stupid to have posted such material publicly after the events of last year, but given he has made himself unable to contactable you've got to assume this may have been a deliberate attempt to escape his contract. People have been saying this a freedom of speech issue, yes Folau has the right to freedom of speech or expression but that doesn't remove him from freedom of consequence either. If he was attempting to make it possible to take up a contract elsewhere he'd need to have one overseas. The NRL (well Peter Beattie - the chairman) have just announced they won't register a contract for Folau. That could change. Beattie is still very much a politician with a demonstrated lack of detailed knowledge of the game. He's great at broad statements - and poorly executed back flips. He could go to the North Queensland Cowboys but I guess his views may be seen as too conservative for Bob Katter and Fraser Anning. Israel Folau has been spotted in Sydney for the first time since his controversial social media posts on Wednesday that has left his career in Australian rugby hanging in the balance. The dual international was seen at a cafe alongside his New Zealand netball wife, Maria, as well the chief executive of Rugby Union Players Assocation, Prataal Raj. The meeting comes after the RUPA issued a statement distancing itself from Folau’s comments. 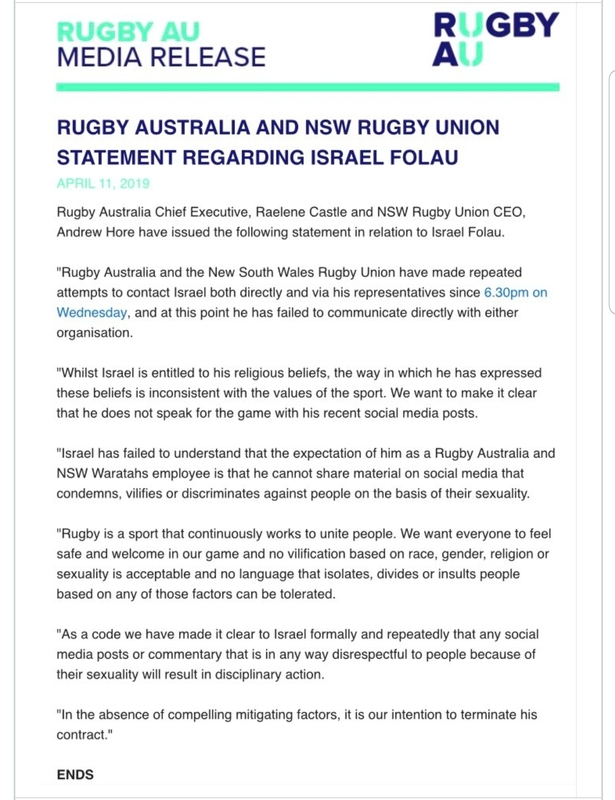 “RUPA does not endorse or condone the content of the social media post made by Israel Folau on Wednesday night, however it is imperative that the proper process if followed under the Code of Conduct,” the statement read. “We will continue to work with Israel, his representatives, NSW Waratahs and Rugby Australia to ensure this occurs. Folau didn’t make a comment to reporters. Until now, Folau hadn’t been seen since the 30-year-old doubled down on his hateful, harmful rhetoric of a year ago by sharing a meme that informed the masses that hell awaits “drunks, homosexuals, adulterers, liars, fornicators, thieves, atheists and idolaters” on Instagram on Wednesday evening. “Rugby Australia and the New South Wales Rugby Union have made repeated attempts to contact Israel both directly and via his representatives since 6.30pm on Wednesday, and at this point he has failed to communicate directly with either organisation,” Rugby Australia ceo Raelene Castle and NSW Rugby ceo Andrew Hore said in a joint statement. I do note that he pulled this during a week where the Tahs had a bye. If they were playing tonight or tomorrow it would have had far greater disruption in preparing for a match. So does anyone else think that his freedom of religious expression has been affected by the rugby schedule? ie, if the Tah's bye was in a weeks' time, would he have waited until Easter to post his opinions? Am I just being too cynical? It's claimed he's on around $2 mill a year here. 26yo Semi Radrada was reportedly offered around a mill a year to go from Toulon to Bordeaux. I wonder if there's anyone who would pay a 30yo Folau well over double that? Maybe there's no hidden agenda here and he's just really dumb? I think the purported $2 mill a year was including some between-season paypacket boosting in Japan ... which didn't happen. So, he is (I should say, was) on a big annual wedge - just not $2m big. Thanks for the info. Sure puts the deliberate strategy theory back in play.